On the evening of May 2, 1806, in Fain-les-Moutiers, France, the ringing of the Angelus occurred; and unknown to those hearing the heralding of Our Lady’s bells, a child was born who would one day be canonized to sainthood. The day after her birth, on the feast of The True Cross, she was baptized Catherine Madeleine Laboure. With the death of her mother, the devotion and love Catherine (age 9) had for Mary was affirmed as she held a statue of Our Lady, kissed it, and said, "Now, dear Lady, you are to be my mother." Catherine (age 24) began her commitment of service to the Daughters of Charity. God blessed her with several visions and her first apparition of the Blessed Virgin was on July 19, 1830. She reappeared to Catherine on November 27, 1830, and said, "Have a medal struck in this form (which she described in detail). "All who wear it will have great graces." When the first medal was struck on June 20, 1832, Catherine urged devotion to it, and, because of the power working through it, it was called the "Miraculous Medal". The front of the Medal represents Mary standing on the earth, her foot crushing the head of a serpent, and her hands outstretched to all who ask her assistance. The prayer encircling her contains one of her most precious titles: "O Mary, conceived without sin, pray for us who have recourse to thee." The rays of light from her hands symbolize the graces which she is very eager to bestow upon those who wear the Medal and pray to her. As you gaze around our beautiful sanctuary, you will notice this image of The Blessed Virgin in a place of prominence to the right of the altar. Catherine died on December 31, 1876. When her body was exhumed in 1933, it was found as fresh as the day it was buried. Her incorrupt body is encased in glass at the Mother House of the Sisters of Charity, 140 Rue du Bac in Paris, France. For the Google Map link, click here. St. Catherine Laboure was canonized on July 27, 1947. Her name graces our church and may her spirit of charity and devotion grace our hearts. While celebrating his 25th anniversary of ordination in Europe, Father William Buckley received a letter from Msgr. Casey, the Vicar General, that Cardinal Meyer wanted him to build a parish in the western Glenview area. It was on this day that Father Buckley and his three traveling companions visited the shrine of St. Catherine Laboure and knelt at the chair where our Blessed Mother sat when she appeared to St. Catherine Laboure. Father was so impressed with the shrine that upon leaving, he announced that St. Catherine Laboure would be the name of his new parish. Upon returning home, Father Buckley was greeted by Father Dussman and Father Ryan, from Our Lady of Perpetual Help, who gave Father a place to live. The Superintendent of Public Schools, then Dr. Springman, arranged for Father to rent the Junior High School gym as a temporary place to say Mass and hold services. Father Buckley visited the site where he was to build a school. The property was a swamp with two lakes and strewn with debris. After a second visit, Father decided that maybe it would be a good place to build a school since it was not on a busy street. The cost of reclaiming the land was $70,000. In September 1960, Father Buckley moved into a temporary rectory at 1615 Elmdale and daily Mass began on September 7 in the chapel of this building. He secured the services of the School Sisters of St. Francis for the parish school. The sisters commuted from Our Lady of Perpetual Help for six months until a home was rented. Father Nugent, who built Villa Redeemer Retreat Center, also helped by recruiting Priests to say Mass; they commuted from Edgarton, Wisconsin to assist. By October 1960, a Ladies’ Guild and Holy Name Society had been formed and plans were underway for a combination church-school facility. On April 23, 1961, ground was broken for a church-school structure; the cornerstone was laid on August 26, 1961. Mass was celebrated in the new church quarters on Christmas Eve, 1961. The school was opened on January 3, 1962. Sister Mary Louise O.S.F. was the first principal. Past principals include Sister Veronica Margareth O.S.F., Sister Bernella O.S.F., Sister Sean Morley O.S.F., Sister Elaine Campbell B.V.M., and Sister Kathleen Heer S.L.W. Cardinal Meyer dedicated the new $750,000 parish building on April 8, 1962. Father Burns was the first associate pastor, followed by Father Paul Burke, Father James Ouletta, Father William Barry, Father Richard Welc, Father Joseph Altman, and Father Walter DeRoeck. Father Julian Harast resided at the rectory and assisted after his retirement as pastor at St. John Chrysostom until his death in 1983. In 1965, a building at 3360 Thornwood Avenue was purchased for use as a convent. On June 4, 1968, John Cardinal Cody approved plans for the erection of a permanent church and groundbreaking took place on June 9, 1968. 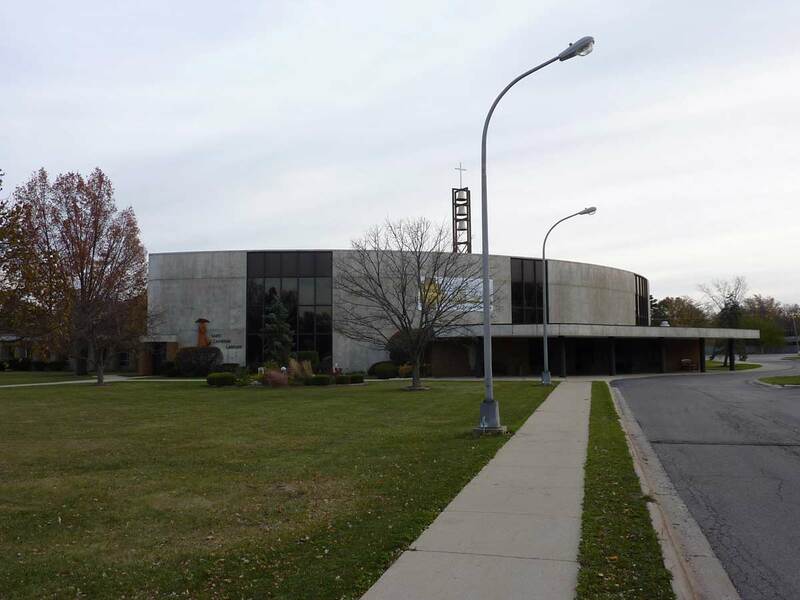 The church was opened officially on October 3, 1969, and dedicated on December 14, 1969 by Cardinal Cody. In 1970, permission was granted for construction of the 4-bedroom rectory at 3535 Thornwood. In the 1990’s, several building projects were undertaken and completed. In 1994, Marian hall was constructed, the existing Father Buckley Hall was renovated, and the new meeting rooms were created for the parish use. 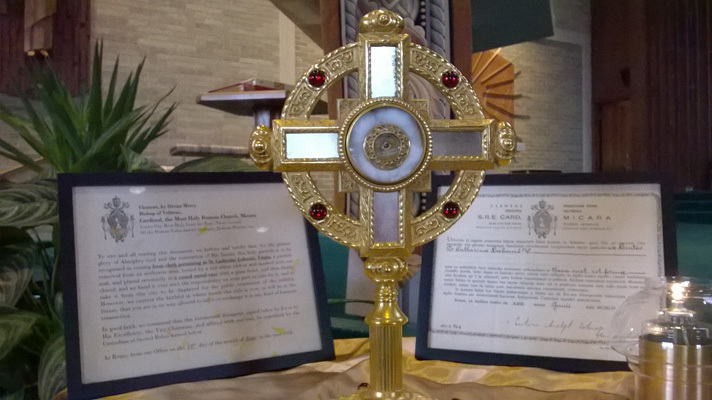 On the Feast of Christ the King, November 26, 1995, the Perpetual Eucharistic Adoration Chapel was dedicated and opened. In 1998, the church and chapel were renovated and the Pro-Life Shrine was built. Francis Cardinal George joined in the celebration, dedicating, and blessing the church, chapel, and shrine on September 11, 1999. The Early Childhood Development Center was completed and opened in the fall of 2001. This will be a year-round center offering daycare for working parents, and will be educationally based. Father Buckley retired on January 1, 1981 and served as Pastor Emeritus. He died on October 7, 1987. He was succeeded by Father Joseph Auer as Pastor until June 1989, when Father James Murphy became Pastor. Fr. Murphy served as pastor for 13 years and then accepted a pastoral assignment at St. Barbara's Church in Brookfield, IL, at which point Fr. Robert Mair, working as associated pastor for the previous 2 years, was assigned to be pastor of St. Catherine Laboure. Fr Mair retired in July, 2008 and is now the Pastor Emeritus. Fr. P. Maina Waithaka was assigned to the Parish to succeed Fr. Mair and is now the current pastor.